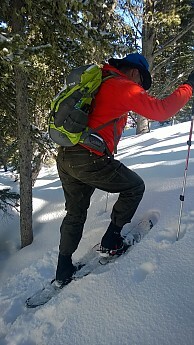 Impressive hiking/backcountry snowshoe from long-time maker of snowshoes, Tubbs. Great weight-to-size/flotation with easy on and off buckling mechanism. Heel lift for extended climbing and fairly aggressive traction make for an enjoyable day hiking the snow covered trails here in Colorado. I purchased these snowshoes in mid-January after it had been snowing quite a bit during December. But then it turned warm, unseasonably warm here in the Denver area with 50s-70s for the rest of January and early February. The place I had planned to christen them turned into a snow/mud trail so I kept waiting for the weather to turn back to winter. 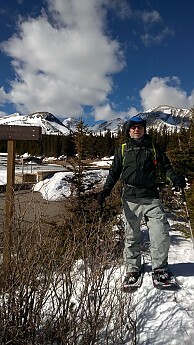 Last weekend, a buddy of mine who is a volunteer with the U.S. Forest Service, and I met up to snowshoe the 5.5 mile out and back to Brainard Lake (northwest of Boulder). His role during the winter is to hike the trails and educate the snowshoeing and cross-country skiing community about the area and also the specific Forest Service rules for that particular given area. The trail generally hovers around 10,000 feet but has some rolling/steep ups and downs which provided a good test for the back country traction. 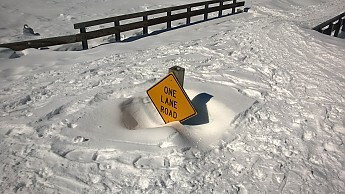 Also, going off trail into the drifts provided some nice flotation testing since the unpacked snow was 3-5' deep. It was still fairly warm that day (high 30s-low 40s) and you can see from the picture below, there had been a lot of meltdown over those three weeks of warm temps. Update: Here's a shot of the same area less than a month later. This is my first pair of snowshoes. Up until this point I had rented them the two or three times I'd gone snowshoeing around various ski resorts. I've never been much of a skier but always felt like I was missing a complete season of outdoor activity. So, this year I decided to commit to more snowshoeing and therefore bought a pair. Why did I buy the Tubbs Wilderness snowshoe? To be honest, it was spontaneous in regard to brand. I had been searching for a pair for about a month but kept resisting because the features I wanted (easy entry, heel lift, aggressive traction, good flotation for my 215 lbs) were on the more expensive pairs and then one day in January I was at Colorado Ski and Golf and they had a 20% off sale on their snowshoes so I bought them. 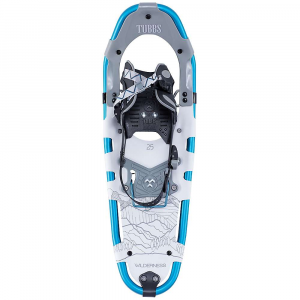 I had been reading about various snowshoe brands here on Trailspace.com and Tubbs had good reviews so I felt pretty confident in my purchase. Now to the snowshoes. For my weight, I need the 30" platform which is rated for 170-250 lbs. I don't really plan to do any winter backpacking, but for those of my size who are into that, the 36" size supports 220-300 lbs. For this hike, I figured my overall weight with snowshoes, 28L day pack w/water bottles, boots, snow pants and a couple of other layers was probably around 240 lbs. Throughout the day, I'd go off the trail into deep drifts to see how they performed. In the loose powder, they would sink about 6" which still made for fairly easy walking. On the trails with the packed snow they were a breeze. They are lightweight at about 4.5 lbs for the pair and they are fairly narrow which kept them from bumping into each other. The traction was great on both the uphill and downhill climbs as well as on the icy spots we had to traverse. Tubbs calls this their Cobra toe crampon which fits under the ball of your foot providing "constant penetrating contact in variable snow conditions." Update: One note is when descending steeper terrain, keep the weight on the balls of your feet since the crampon contains the perpendicular teeth to keep you from slipping. If you get on your heels the teeth under the heels don't offer much grip to prevent slipping (see image below for the heel teeth). I think I'm going to bend the two back tabs inward more to create some level of slip resistance. 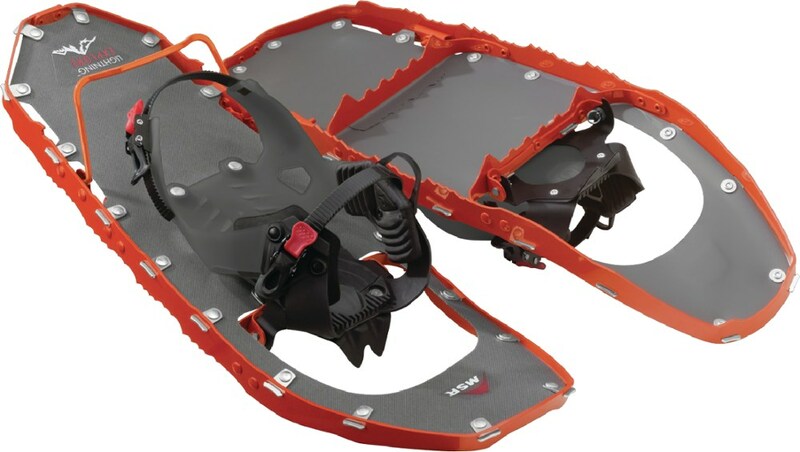 The Tubbs Xpedition and the Mountaineer snowshoes offer a better design with the last two teeth turned in more to provide some level of perpendicular grip). I also have one benefit to add. The snow we were on was fairly wet and my buddy who was using MSR snowshoes was having issues with snow balls clumping under his crampon. I had no issues with this and I think it has to do with the plastic covering (see image below) that sits inside the circle of teeth. His snowshoes have only metal so I suspect the plastic material has more of a teflon effect. I regretfully didn't take any pictures of this first hike other than the one above. I'll be sure to capture more on my future hikes and update this post to show the benefits of the features I'm about to describe. The feature I was most impressed with is what Tubbs calls their "rotating toe cord". 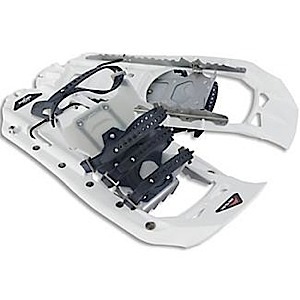 The design allows for the tail of the snowshoe to not flip up causing annoying snow flinging up your back and head. The rental pairs I used over the years did this and when the snow went down the back of your neck it was a nice surprise. With the Tubbs, the tail stays flat on the ground with each step preventing the snow flip and also maintaining traction a bit longer. The second feature I really like is the ease of putting on and taking off these snowshoes. Even before you use them the first time, you can set your boots in them, adjust the heel strap, adjust the slide in clip mechanism and then forget about adjusting them again. Once at the trailhead, you just slide your heel into the platform, grab the strap with the slide in clip and push it in a few clicks until it is secure. You're done with no sitting and fussing with several adjustment straps. 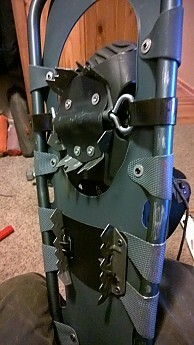 To remove the snowshoes, I just used the tip of my hiking pole and pushed down on the locking tab. The clip released and I stepped out of the shoes. This is the same mechanism I have on my Pearl Izumi bike shoes and they have worked flawlessly for years. Time will tell how this holds up with more extreme use and I will post an update if they end up having issues. 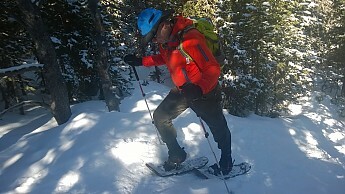 The last feature I was looking for in a snowshoe (but didn't get to try on this hike) is the heel lift. This hike had several good uphill climbs but they were not long enough to worry about engaging this feature. Tubbs call this Active Lift 16 which provides for 16 degrees of hill lift for reducing calf fatigue and Achilles tendon strain on the longer climbs. The picture below shows it engaged for demonstration. I must say, my first impression is really good. These snowshoes are versatile in that they are comfortable and capable both on the packed trail as well as the fluffy stuff. Their weight rating appears to be right on, in that I was right at the upper limit of the 30" platform and I easily made my way through the unpacked, off-trail traverses. Time will tell about the durability of the clipping in system and the platform material. I'm rating the Tubbs Wilderness as four-stars for now because of my limited use and will adjust my rating after a season of use. Thanks for the initial review, jboothmtnbkr. I hope you get enough snow to fully enjoy these for the rest of winter. Hope so too. Possibility for 6" this coming Monday so that'll be a boost. I get to go snowshoeing once a year (my trip is next week). Thanks for the review. Have a great trip Goose. We got 8" of snow last night and today. More coming in a few days. How was your snowshoeing trip Goose? It didn't happen. :( I have an achilles tendon injury that 1) ended my chance to run the Illinois Marathon in April, 2) ended my snowshoeing for last month, and 3) ended my caving trip for this weekend. I HOPING I can still do my annual backpacking trip in 3 weeks. I'm sorry to hear that. Achilles tendon injuries are a real pain. Good karma your way for a fast recover. I loved my Wilderness 36s and would still have them if I hadn't somehow broken the plastic heel pad. 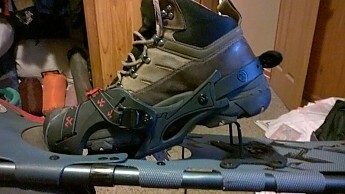 Mine got a lot of use over the 3 years I had them and I never had any problems with the bindings loosening or releasing. 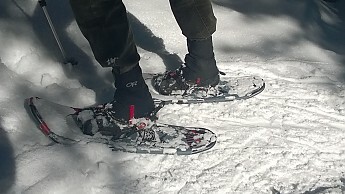 Great snowshoes with very aggressive traction for day hikers. 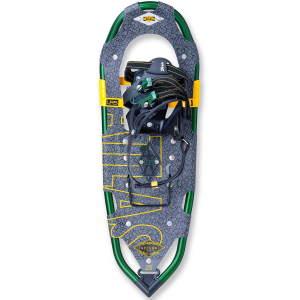 Excellent snowshoes for use on all but the steepest terrain. Lightweight, with comfortable bindings that are easy to enter and exit even with gloves on, they have plenty of flotation to take you just about anywhere. About 3 years ago I bought myself a pair of Tubbs Wilderness 36 snowshoes to replace my old Yubashoes Borderlines that I'd given to a friend's son so the 3 of us could hit the trails together. 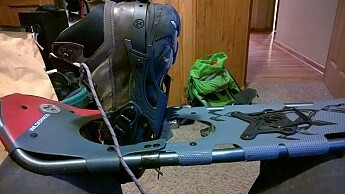 Setting up the bindings is quick and easy, and once set you don't have to make any changes unless you use different boots. Simply place the ball of your foot over the pivot, tighten the heel strap, insert the ratchet into the buckle, and give the single strap per binding a yank to snug it up. To exit, release the buckle and step forward out of the binding. It's that simple. The binding straps are long enough to fit oversized boots like my Sorel Conquests, but if you wear an uninsulated hiking boot late in the season you won't be swimming in the bindings. As day hiking/exploring snowshoes, the Wilderness has fairly aggressive toe crampons — not up to mountaineering use, but fine for anything less. Traction on both ascents and descents is very good, with nothing more than a simple kick step being necessary for most hills. The heel lift lets you keep your feet closer to level on long uphill climbs, reducing calf strain, and is easily flicked up or down with the handle of a trekking pole. They really do make a difference, and make steep hills feel more like stairs because your toes aren't trying to touch your shins. These are big snowshoes, and they have great flotation as you'd expect from their size. While breaking trail in softer snow I'd sink 3-4 inches, and maybe an inch at most on more packed snow. 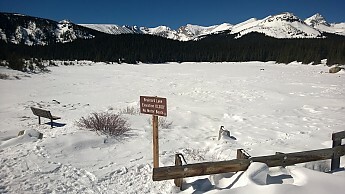 Snowmobile trails were like paved roads, you'd see where your crampons dug in and that was the extent of your sinking. The only thing I didn't like about the Wilderness was the graphics, but it's hard to find solid-colored snowshoes these days. Besides, I don't spend much time looking at my feet, and as long as they don't have Barbie or Hello Kitty graphics I can live with anything. I broke my Wilderness this past winter, apparently I stepped on something that broke the plastic heel pad where the heel lift comes up. I brought the shoes back to the retailer where I'd bought them (EMS) for warranty service or exchange, but they must have had a record year for snowshoe sales because they had nothing to give me in exchange. So I took a store credit voucher (which didn't last long), and searched for their replacements online. About a week later I got their replacements - a pair of Tubbs Mountaineer 36s. But, that's a review for another time! 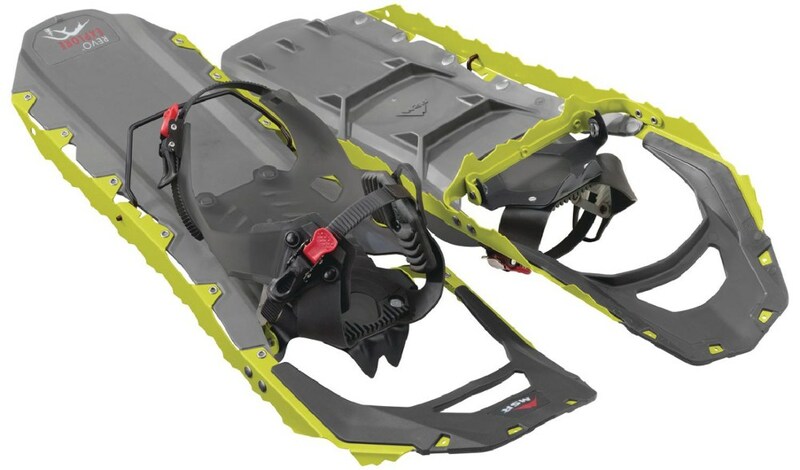 I'd recommend these snowshoes to anyone, with absolutely no reservations at all. Another nice review, Phil. Thanks for sharing it. I have been using snowshoes for over 30 years. I have used traditional wood and gut, military, and more recently the modern metal and plastic (by Tubbs). My last pair of Tubbs lasted about 5 years. The frame and decking held out but the pivot and binding eventually broke. I requested the manufactures send me a pivot and a couple of new bindings. However, the old Tubbs which were made in the USA are now manufatured in China. Instead they took my old pair and sent a new pair of Wilderness Tubbs — what a dissapointment. The frame is of thinner tubbing, and has a join hidden under a section of the decking — a weak spot. The decking, although not as noisy on crusty snow — is so thin you can cut it with scissors — or have it punctured by a beaver stick. The binding has hinge rachets, and small plastic snaps that are weak and could easily fail in cold weather or stiff hands. In short, Tubbs are not what they used to be. The new models function well, but are not robust enough for serious use. I wouldn't expect their design and material to last more than two winters. 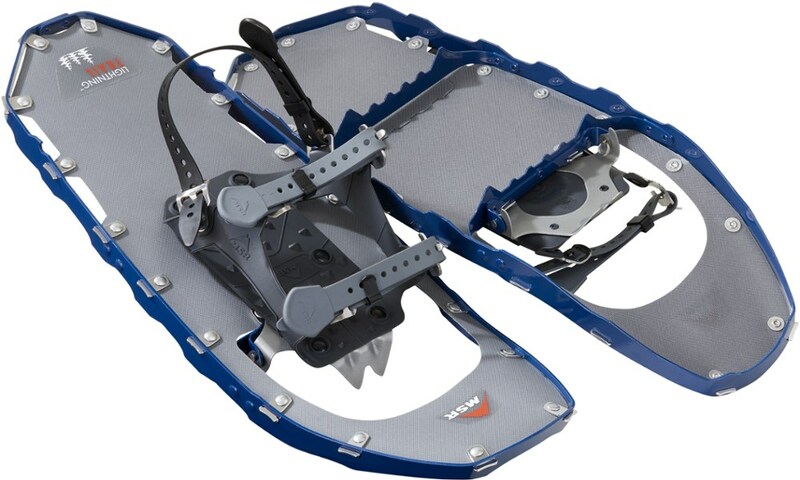 Good all-around snowshoe that's worked well for me on both gentle terrain and in the backcountry. 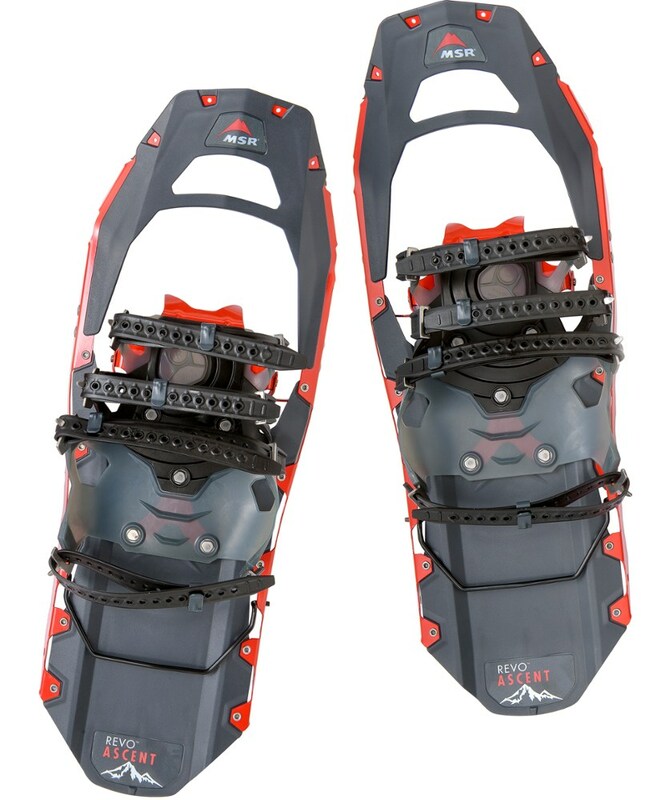 The bindings are easy to use and the crampons provide adequate traction on hard packed snow. 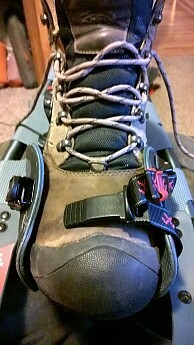 I bought these snowshoes around Christmas and used them through the 3-month winter hiking season. I found that they performed well in a variety of environments, from powder snow on level trails to steeper, icy uphills. Although they don't have the traction as some of the "alpine" models, they worked well for me in the backcountry on steep slopes. The heel-lifters are fairly easy to snap up and really help with long climbs. 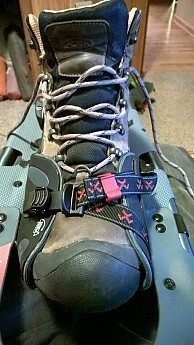 The bindings are easy to adjust, but did seem to loosen a bit (and need readjusting) after lengthy up and downhill hiking. If you're planning to use these in the backcountry, one drawback is the fairly flimsy deck material. Something more ridgid would work better for rough terrain with a lot of elevation changes. Mine are still holding up fine after a season of use (including four backcountry trips), but I'm not sure how they'll hold up over multiple seasons. Overall though, these snowshoes do a lot for the price. I won these snowshoes in a raffle. I had done a few snowshoeing hikes, mostly on flat terrain up to that point. With the first time out I noticed a huge difference in older and cheaper models. They are lightweight and after a few minutes of getting used to them they are extremely easy to use. The grip and stability is incredible. I like these so much that I bought my wife the women's Wilderness snowshoe. She wasn't very keen on snowshoeing but with these she has grown almost a greater interest in the sport than I have. These are a definitely a must-have. Tubbs has won themselves a customer for life.